What a beautiful day for a Mardi Gras parade and a beer tasting on the bayou. 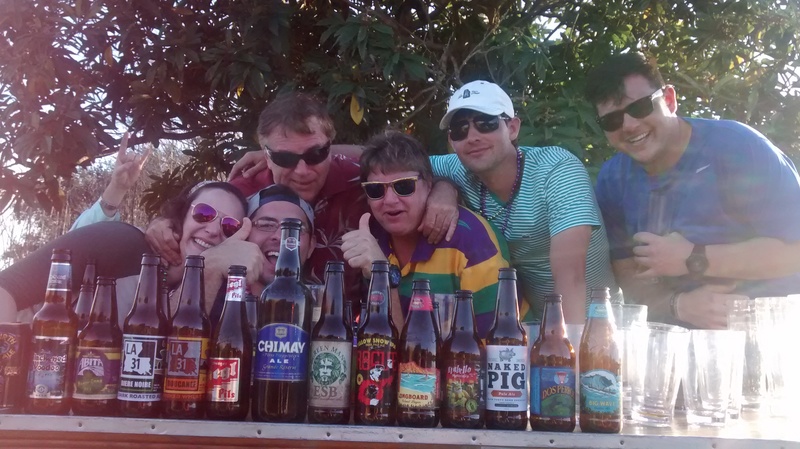 Before the parade, we set up a table and beer glasses on the bayouside under a large Japanese plum tree. With the smell of BBQ, boudin, and fried chicken in the air, we began the tasting. The Big Wave Golden Ale was a perfect to start the tasting. This Hawaiian brew, with its golden hue, is clean and crisp with slight citrus overtones. A few people even sensed traces of pineapple. The Dos Perros Ale was a totally different animal compared to the first beer. This dark brown ale with hints of caramel was quite smooth. The Yazoo brewery is striving to make a Munich style brew made by German Brewmasters in Mexico after World War II. The beer is comparable to a Dos Equis Amber. Then we come to the Naked Pig Pale Ale. What a name for a beer! It was named the best beer in Alabama by Food and Wine Magazine a few years ago. Great balance for a pale ale, with that distinctive hoppy back end. The Stabello and Longboard lagers sandwiched nicely between the two IPAs. The two lagers were both crowd favorites. However, the Yellow Snow IPA from Rogue was definitely the most controversial beer. Like the Naked Pig, some people just don’t like that hoppy characteristic of an IPA. I thought it was probably the best beer of the tasting. Great balance with a nice jolt of hops. Traditionally, we always end the tasting with the great Chimay Grand Reserve made by Belgian monks. The favorite beers of the tasters were probably between the two Hawaiian beers. However, there was a small section that preferred the two IPAs. There was an overall consensus that all the beers were quite tasty and of great quality. No dogs!! Just another great, successful beer tasting. Beer was so good, photographer forgot to take a picture….